After months of leaks, today Microsoft officially announced the Xbox One S All-Digital Edition. It's exactly what it sounds like: an Xbox One S that doesn't have a disc drive and, obviously, only plays digital games. It's scheduled to release on May 7 for $250. The launch bundle for the All-Digital Edition will also include three games: Minecraft, Forza Horizon 3, and Sea of Thieves. 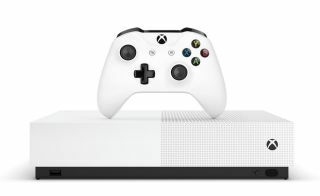 The Xbox One S All-Digital Edition doubles down on the rising popularity of digital downloads and is clearly positioned as a cheaper entry point for folks who are either late to the Xbox party, or who already own a current-gen system and are looking to play Xbox exclusives as cheaply as possible. It's about $50 off the price of a normal Xbox One S, for starters, and that price point is one of its greatest strengths. Microsoft says it will "maintain at least that price difference between the two consoles going forward." In other words, when the Xbox One S gets a price cut, so will the All-Digital Edition. There are already plenty of normal Xbox One S bundles available for $250 or less, so it'll be interesting to see how Microsoft keeps up with that price difference going forward. Xbox Game Pass, the Xbox One's subscription-based digital library, will be especially relevant to All-Digital Edition owners - and, relatedly, so will hard drive space, so it's a good thing the console reportedly comes with a 1TB drive. On the heels of the system's reveal, Microsoft also announced Xbox Game Pass Ultimate, which bundles Xbox Live Gold and Game Pass together for a cheaper, all-in-one subscription. Additionally, All-Digital systems will come with a bonus Game Pass offer to help buyers kickstart their digital collection. Find more to play in our list of the best Xbox One games. Or if you're more in the mood for commiseration, enjoy this video look at asinine stunts we can't stop pulling in games.